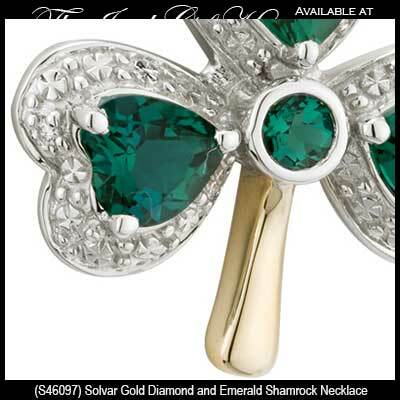 Shamrock necklace features emerald leaves that are surrounded with diamond accented white gold. Sorry, this gold shamrock necklace is now sold out. This 14K yellow gold shamrock necklace features four lab created emeralds that are inlaid in the center along with each leaf. 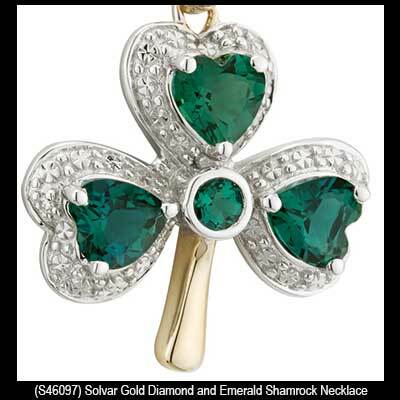 Each leaf of the shamrock is surrounded with engraved white gold with an accent diamond; the 3 diamonds have a 0.015ct. total diamond weight. The emerald shamrock pendant measures 3/4” wide x 1" tall, including the jump ring and the chain bail, and this piece of Irish jewelry includes an 18” long 14K yellow gold chain. 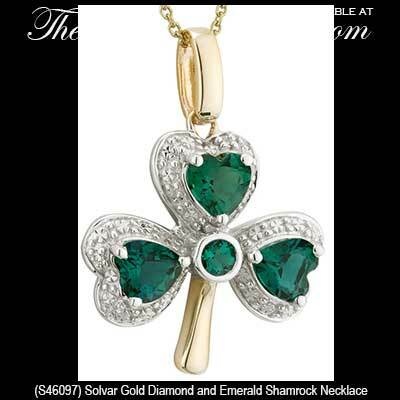 The Irish necklace is made by Solvar Jewelry in Dublin, Ireland and it is gift boxed with a shamrock history card that is complements of The Irish Gift House.